Join the discussion on our forums! Come discuss Fallen Sun Cleric over in our dedicated Fallen Sun Cleric discussion topic. It's hard to keep a Shattered Sun Cleric down. This card may not look like much but it's actually devastating in arena if its effect is activated turn 2. I actually really like this card. Zoolock, budget aggro decks, and arena only. "We must defile the Sunwell!" Agro Pali looking annoyingly strong with cards like this. As it looks a bit like an undead version of Shattered Sun Cleric, they should do they same thing they did with Sorcerer's Apprentice and HER undead counterpart, Doomed Apprentice. So like... instead of giving +1/+1, maybe give -1/-1 to ANY (or even just enemy) minion? I guess the flavor text will tell us the story. 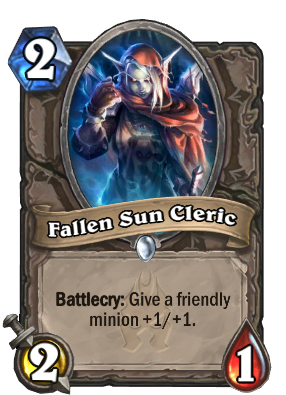 Dead Sun Cleric (0) cost 0/1 Battlecry: Give a Friendly Minion +1/+1. Better solely because it's cheaper, but still not that big of a deal. Obviously not constructed level by any means, but it could work in low rank token druids. In arena getting an unexpected buff to something is apparently worth around 1 mana (shattered sun is an above average card on heartharena for 3 mana with 2 mana worth of stats). Scaling down the size however from 2 health to 1 health means that its actual value depends on what the strongest classes will be.... and we almost always expect mage + rogue. So I think this will be at least average to above average in arena.